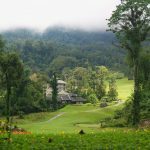 The Borneo Highlands Resort is located in the Penrissen Range and sits at an altitude of about 1000 metres above sea level. Besides exploring the lush green rainforest, guests get to enjoy the much cooler climate of the highlands here. Nestled in between Kuching’s bustling Waterfront, the charming streets of Chinatown and the colourful India Street, the Waterfront Hotel is located right in the heart of the city centre. 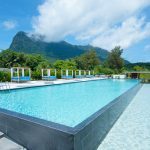 Located at the foot of Mount Santubong and the shores of the South China Sea, this boutique hotel represents a retreat that offers pure luxury, peace and privacy. Once a pre-war family mansion that later became the all-girls St.Mary’s boarding house and the diocesan centre for Kuching’s St. Thomas Cathedral, The Marian Boutique Lodging House has been lovingly restored to reflect its original heritage and charm. The LimeTree is a unique boutique hotel with a zesty feel, offering contemporary comfort. 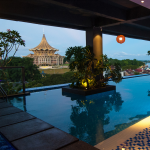 A rooftop lounge invites its guests to enjoy a cold drink while enjoying the views of Mount Santubong and the Sarawak River. Ariva Gateway Kuching features 34 serviced residences with either 2 or 3 bedrooms, offering great value for families, as well as 32 guest rooms. Connecting units are available, which allows to accommodate even big families. 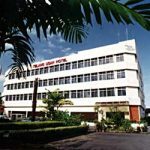 Opened in 1989, the Telang Usan Hotel was the first hotel owned and managed by a native Sarawakian from the Orang Ulu tribe. This hotel will charm you with its authentic ethnic arts & decor, native cuisine and the sincere friendliness of Sarawak’s people. 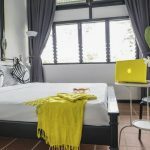 Nanga Damai is a boutique guesthouse, located on the Santubong peninsula. Surrounded by lush rain forest and situated on the steeply sloping foothills of Mount Santubong, where it is overlooking the South China Sea, it provides stunning views of the scenery as well as complete tranquility. 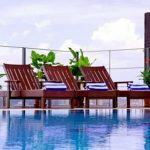 Batik Boutique Hotel is a lifestyle hotel with chic and trendy rooms, unconventional hotel facilities, and an enthusiastic and helpful staff crew. 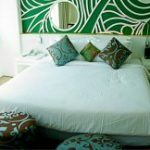 Permai Rainforest Resort is an eco-resort set in pristine rainforest, located on the shores of the South China Sea and at the foot of Mount Santubong. 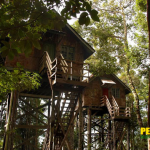 Treehouses offer the unique experience of sleeping amongst the trees and waking to the sound of the sea lapping against the shore. Located at the Waterfront, in the heart of Kuching, which is a pleasant area to stroll. The hotel features an outdoor swimming pool, overlooking the Sarawak River, and pampers its guest with all sorts of facilities and services. 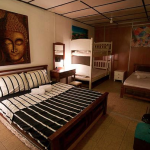 Formerly called Nomad B&B, this hostel has recently been renovated and renamed as ‘Le Nomade Hostel and Café’. It is a place of passage and a place of life, with travellers from all over the world gathering here. 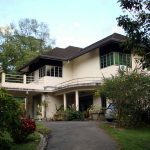 The Fairview Guesthouse is surrounded by a big beautiful garden with a fish pond, palms, as well as tropical fruit trees. This little oasis gives it the feeling of being a hideaway, although being located in Kuching’s city centre. Away from the hustle and bustle of the city centre (about 20 minutes walk), Basaga Holiday Residences offer you a peaceful and relaxing ambience. Surrounded by tall shady trees and a luscious tropical garden, a salt-water pool invites to cool off from the heat of the day. Basaga Holiday Resort is located on Siar Beach, approximately 1 hour 20 minutes from Kuching. Surrounded by jungle, beach and the sea it offers pure relaxation.